AT $200 (N.P. $325) NOW! 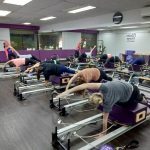 Your first class must be a “Reformer Introduction Class + Weight Loss Pilates”, “Reformer Introduction Class + Flexi-Stretch Pilates” or “Reformer Introduction Class + Core & Body Aches Pilates” Class at any Pilates Fitness studios. Reservation via call / SMS / whatsapp at +65 9184 7622 is required before your first class. Please present your Volkswagen / ŠKODA car key during your first class. Your 5 class pass is valid for 1 month. Expires on 24 December 2019.